I hate summers in Arkansas. 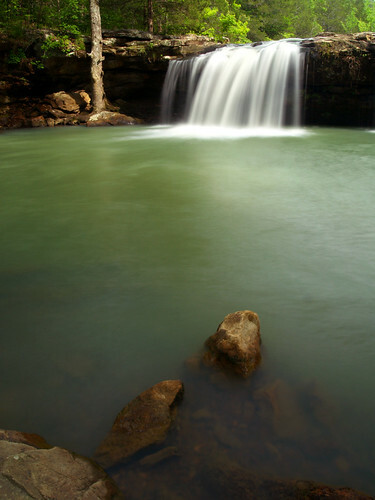 It is hot and muggy, and the lack of rain dries up most of the waterfalls. Yesterday was the hottest day of the year - with a high of 101. Thanks to the high humidity, the heat index was somewhere around 2000 degrees (give or take). With weather like that, you just want to sit in air conditioning and not do anything at all. So of course, my day on Saturday was spent helping a friend move. And yeah it wasn't great, I don't think I've ever sweated that much in my life. You could just stand outside and start to sweat - it sucked. Only three more months until fall! 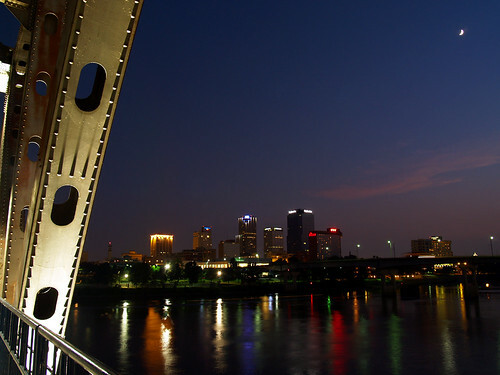 It wasn't that bad when I went out Friday night to take some pictures along the Junction Bridge (probably only in the low 90s). Usually when I take pictures there I have some sort of bizarre encounter with a crazy person. But not that night, in fact people were actually very polite. One person walked by and said "how are you doing, sir?" And as it got darker, another view of the skyline from the bridge, along with the crescent moon. Made a quick trip over to the Big Dam Bridge a few nights ago. I was a bit surprised that these pictures turned out, especially since I wasn't expecting there to be a good sunset that night. On Saturday I met my friend John and we drove out to the small town of Scott, located just a few miles east of North Little Rock. Scott is an old farming town, with many old silos and barns. Also, it's home to the Cotham's restaurant, which is where we started out our trip. Alas, I didn't order the famed Hubcap Burger, just a puny regular sized one (and I wasn't able to finish that, anyways). We headed south and passed through miles of farmland on each side of the road. Along the way we passed by this old church, tucked away along a side road. On the other side of the church was an old cemetery, which was nearly obscured in some parts by tall grass. It was a melancholy kind of place, it somehow seemed like the only recent visitors to these graves were grasshoppers. Some other parts of the small cemetery looked like it was more taken care of, at least. This area was the home of several large plantations, and we passed by several groves of pecan trees that perhaps belonged to a former plantation. 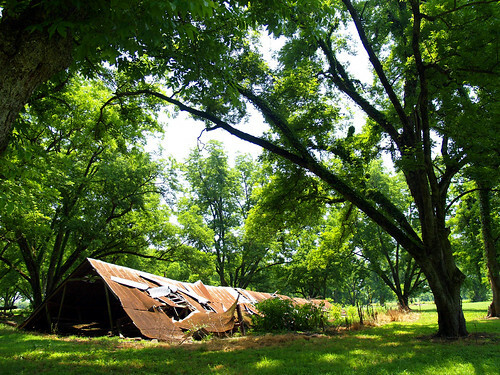 We stopped at this one spot, where a large barn had recently collapsed in on itself. All that is left now is the roof, which seemed to survive the fall ok. I walked up to it and had a peak inside. There was still hay sitting in the barn's loft, which was now ground level. Or well it wasn't exactly abandoned. 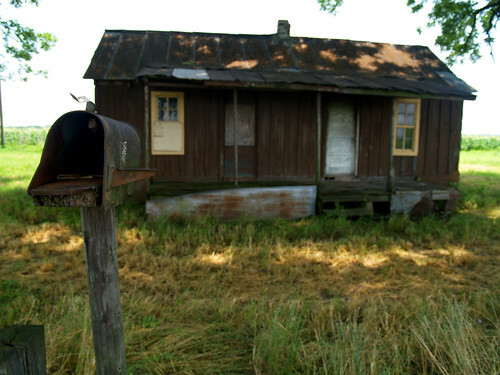 I was interested in the mailbox in front of the old house, and got a few pictures of it. I noticed that there was an old newspaper in the mailbox, and I began to reach in to see what the date was. I stopped before my hand got about halfway there, because I noticed that there was a big mud dauber's nest in the mail box, with a mean looking wasp hanging below it. It probably wouldn't have been wise to invade his territory too much. 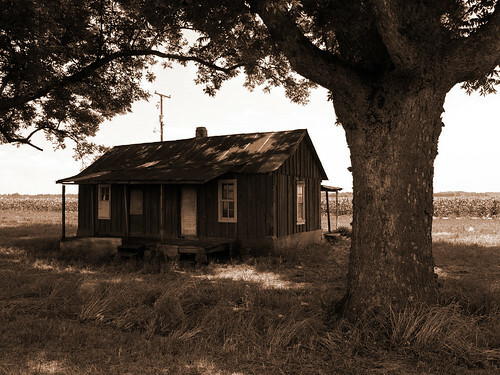 That old plantation home is located along a neat stretch of road. 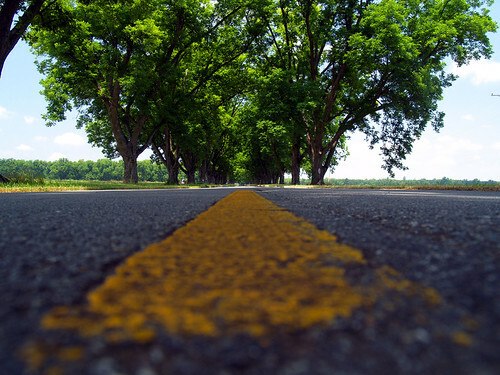 There are rows of trees planted along this bit of highway, which seems to stretch on for a few miles. We stopped to get a good shot of the tree-lined road, but mine didn't really turn out. There wasn't much traffic out, so I hurried out to get this shot of the road, taken with the camera sitting right on the pavement. It had been a long day. It started well before 7am, waking up to a foggy campground at Steele Creek. 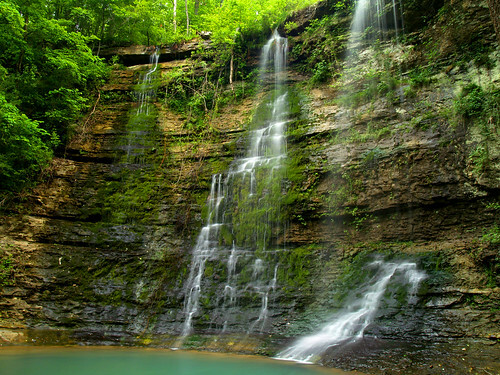 From there we drove through Boxley Valley, hiked the three mile trail to Hawksbill Crag, visited Triple Falls, then drove down to Falling Water Falls and Six Finger Falls. But it was one of the best photography days I've had in awhile. 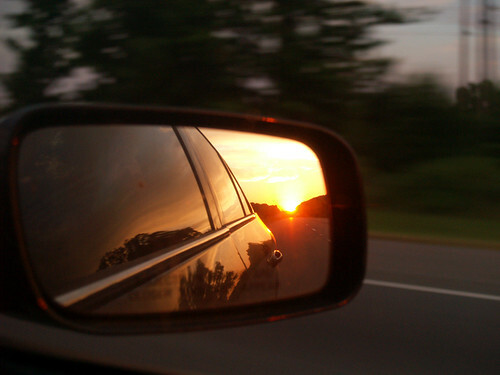 We drove down Falling Water Road towards pavement and civilization. The camera battery was saying it was low, so there weren't too many stops after that. 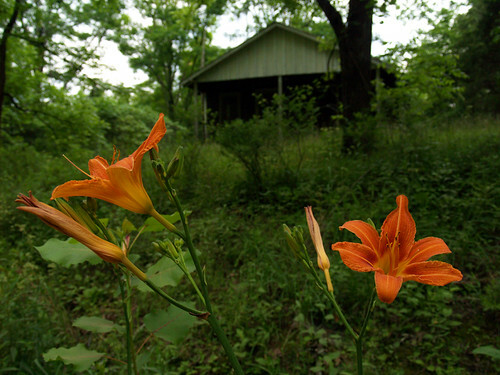 But along the road, past Falling Water Falls, we stopped at this abandoned house with a guard of wildflowers standing before it. I tried to get a few shots with whatever juice was left in the battery. From Falling Water Falls, we drove a few miles to the north to hit our last waterfall of the day. It had been a long day, and we had great timing at these falls. Again, we got there and had the falls all to ourselves. The last time I visited these falls there were some idiots camping on the rocks right on top of the waterfall. 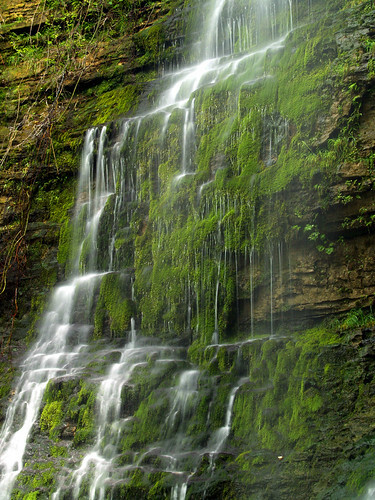 These falls aren't very tall - only just about six feet high. 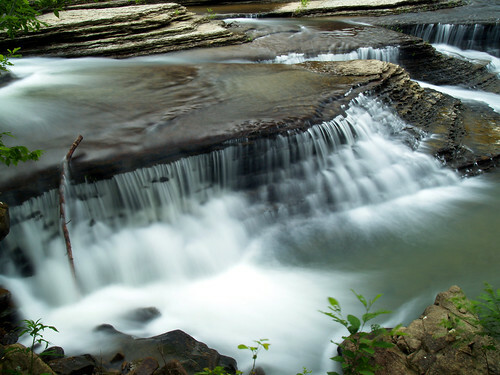 The falls get their name because the creek has carved six channels into the rock here, which from above looks like a hand with six fingers. 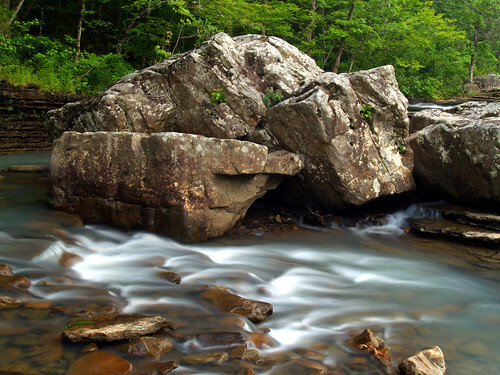 We walked around and dropped down by the creek, but the falls were blocked by these boulders. It is a very scenic little spot. 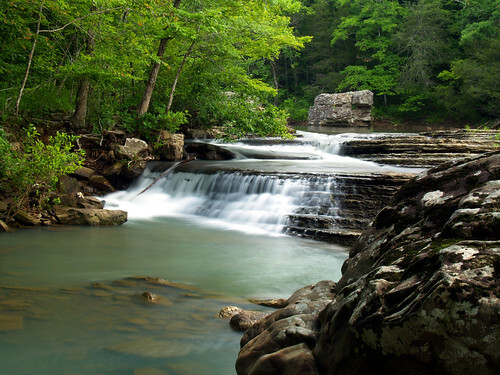 Six Finger Falls sit right at the edge of the Richland Creek Wilderness. 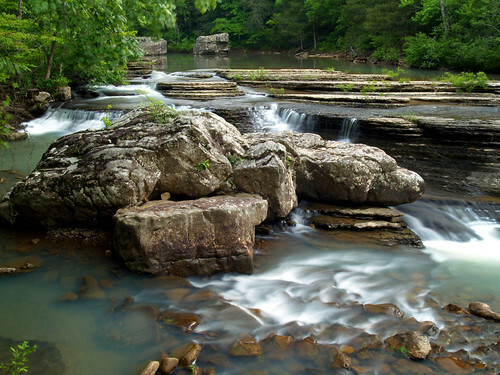 From here, Falling Water Creek runs right into Richland Creek, which then flows into the Buffalo River. 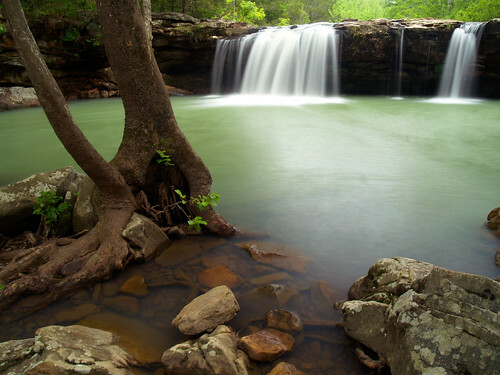 The Richland Creek Wilderness is an amazing area, with great (but hard to reach) waterfalls. Sadly, Falling Water Road is still blocked from a landslide that occurred last year. There's no telling how long it will be before the Forest Service manages to get it cleared out. As I was taking the above shot, the camera flashed something that strikes fear into any photographer standing at a great spot like this - the "low battery" warning. Apparently the chilly night before and the day full of shooting took its toll on the poor battery. I changed formats in the hope of getting as much juice out of the battery, and then rushed around trying to get as many shots of the falls as I could. I dropped down on this one flat rock right by the creek, which was flanked by this small baby bluff. Water was dripping off, creating some tiny waterfalls. I wasn't sure how much power the battery had left, so I tried to get as many shots as I could at different spots. This is the view from the side of the falls, with three of the six fingers visible. And the view from above the falls. There were two pools that were filled with tadpoles up there. 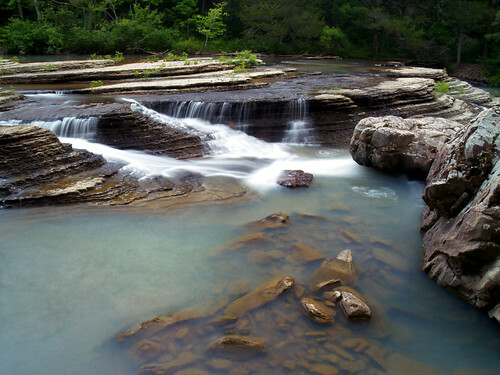 After lunch in Jasper, we drove away from the Buffalo River and headed to the south towards Falling Water Falls. 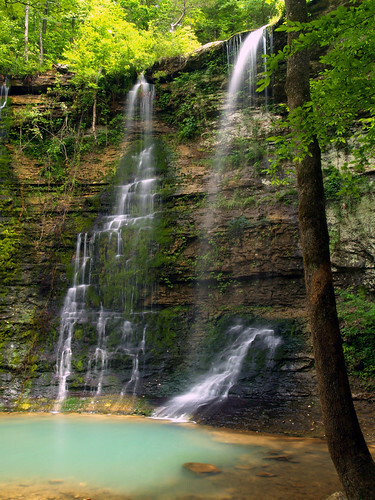 Located in the Ozark National Forest, Falling Water Falls are located along Falling Water Creek. 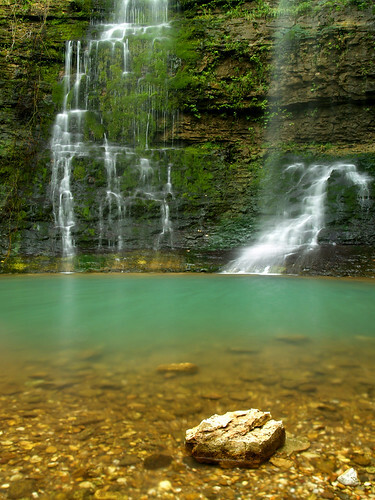 The falls and creek can be reached via the Falling Water Road (of course). 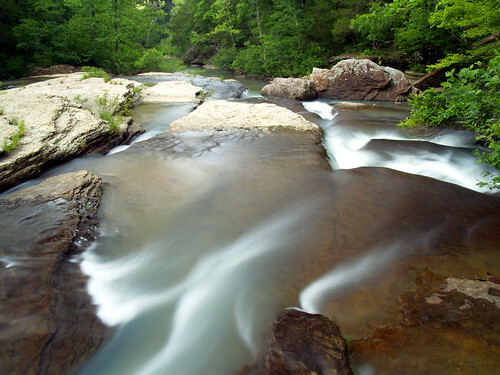 The road runs alongside the creek, which flows into Richland Creek. 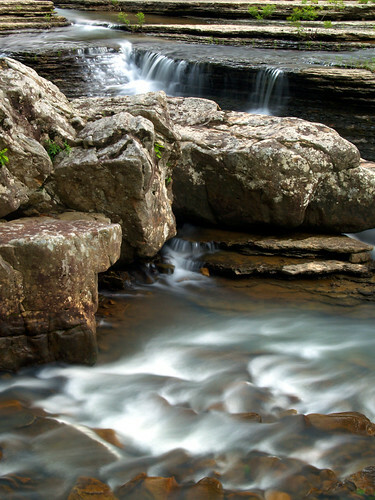 Last year a landslide closed the road a few miles north of Falling Water Falls, which has still not been cleared away. 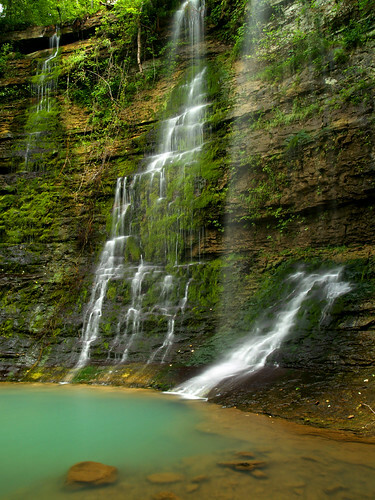 But the falls are right next to the road, so they are very easy to reach. It hadn't rained in awhile but there was still a nice amount of water in the falls. 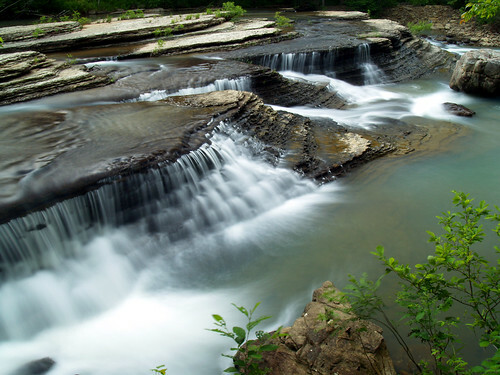 It is a very cool waterfall, one of my favorite ones in the state. Falling Water Falls isn't very tall, only ten feet, but it is very photogenic. 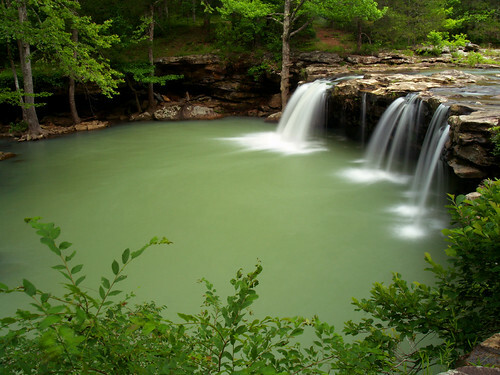 The falls empty into a large pool, that is also a popular swimming hole in the summer. Again I was amazed that there weren't other people out there too. When we got there, we had the entire place to ourselves. 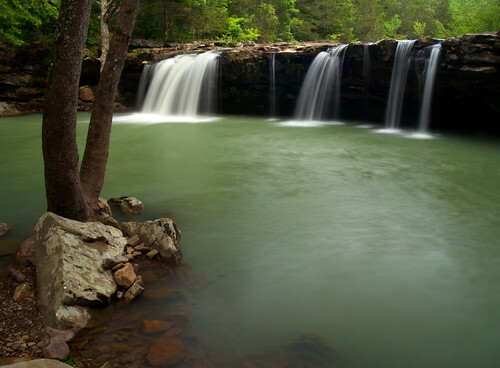 After finishing the Hawksbill Crag trail, we drove through Boxley Valley and headed towards our next destination - Triple Falls. 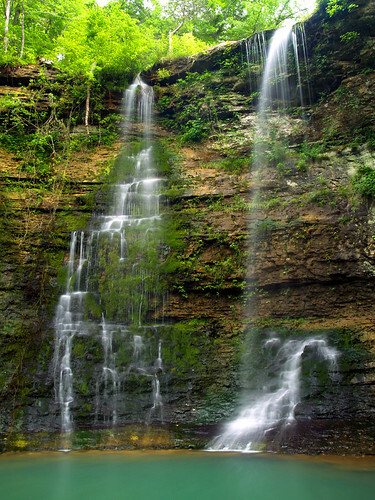 This waterfall is located within the boundaries of the Buffalo National River, and is part of a Boy Scout camp. 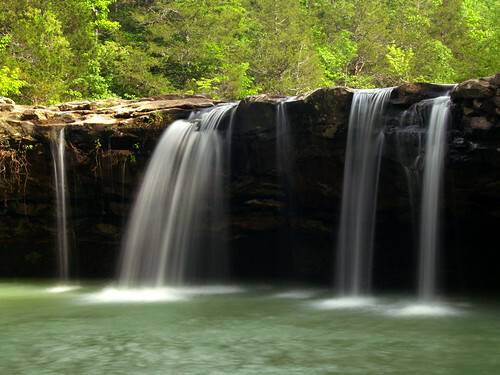 The falls are officially called Twin Falls, but are commonly called Triple Falls because there is often three waterfalls flowing down over the bluff. To get to the falls you drive down a bumpy dirt road. 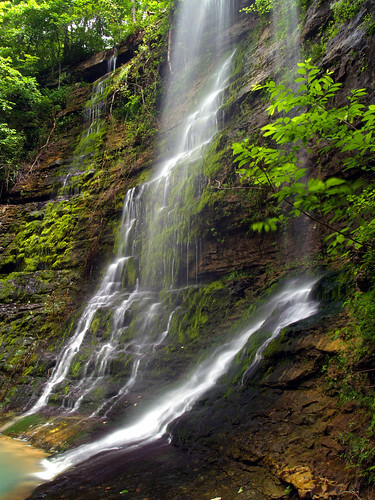 But the falls are easy to reach, it's a very short hike from the parking area to the falls. 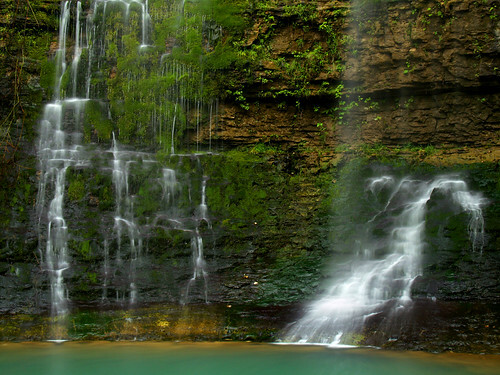 The waterfall is 48 feet high, and is a nice spot to visit. Apparently there are two sources for this waterfall. 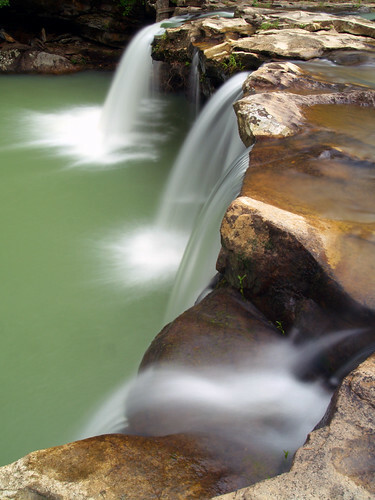 The waterfall on the right is fed by a creek, while the two on the left are fed by a spring. There hadn't been much rain here in the past few days, so there wasn't much water going through. This is also a popular spot for photographers, and I was again amazed that we were the only ones out here. It is indeed rare to get to spend time in places like this without other people out as well. From there we drove off towards Jasper, where we got a late lunch at the Ozark Cafe. 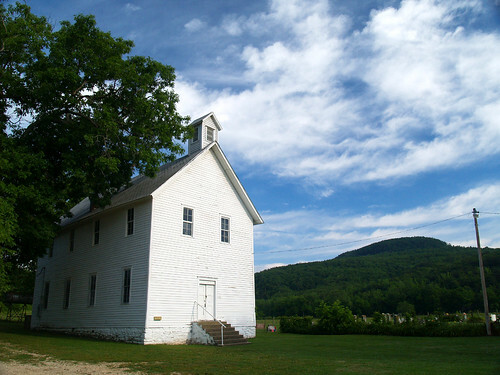 From the Boxley Valley Baptist Church, we drove onwards towards Hawksbill Crag. My Aunt was driving down to meet us at the trailhead, so we drove off to get there in time. The drive up to Hawksbill Crag is interesting, to say the least. 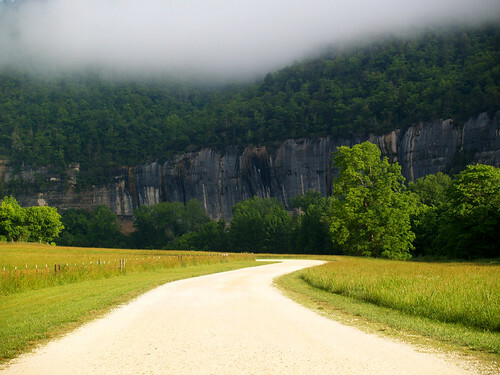 To get there from Boxley Valley, you turn off onto a dirt road called Cave Mountain Drive. 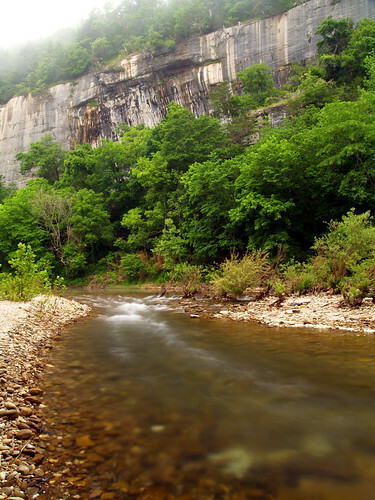 The road runs alongside the Buffalo River, but then steeply runs up Cave Mountain. And I do mean steep, the road heads up at a crazy angle before finally leveling out at the top of the mountain. Along the way we passed a group of birdwatchers who had randomly stopped their cars in the middle of this narrow dirt road, and a large group of them were standing in the road. We slowly drove by as they gave us weird looks, offended that we would dare drive down the road. After six miles of bumpy dirt roads, we finally made it to the Hawksbill Crag trailhead. I was amazed that there weren't any other cars parked there already. This is a popular trail, and I've never seen this parking lot empty before. My Aunt soon drove up and we started on the hike. The trail is short, just 3 miles round trip to the crag and back. The woods here were damaged in the ice storm a few months ago, and there were several fallen trees along the trail. But this is such a popular trail that there were already well-worn detours around the downed trees. The trail heads down a hill, and then crosses a creek with a small waterfall on it. 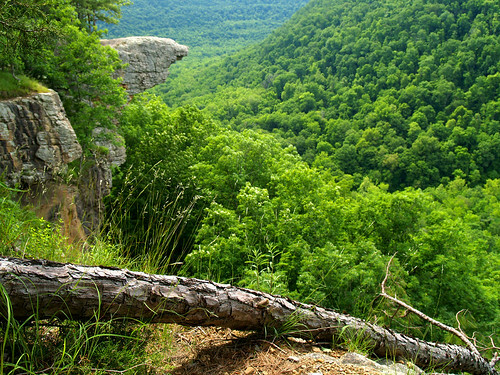 Then the trail runs alongside the bluffs, providing some great views of the Ozark Mountains. 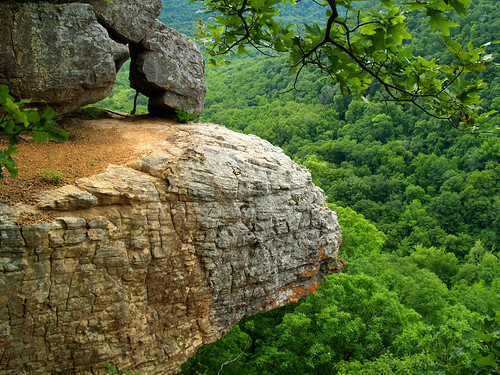 Eventually the trail reaches Hawksbill Crag, a sandstone rock outcrop that juts out 100 feet above the Whitaker Creek drainage below. One example of the damage from the ice storm was this pine tree, which fell and dangled precariously over the bluff. I was amazed that we were the only people out there. This is a popular trail, and I've never been here without seeing other people out on the crag. It was odd to be here without anyone else around. 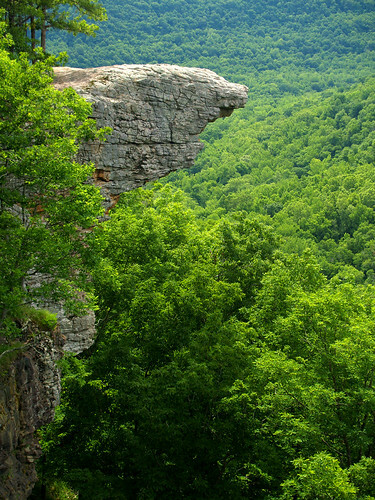 Hawksbill Crag is said to be the most photographed natural feature in Arkansas. But I have to call shenanigans on that claim. 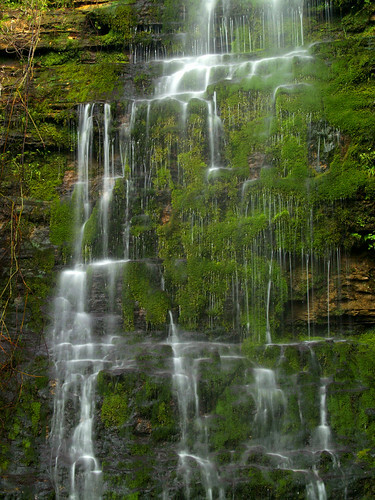 There are a few other places that are bound to have more photos taken of it, like Pinnacle Mountain or Cedar Falls at Petit Jean Mountain. 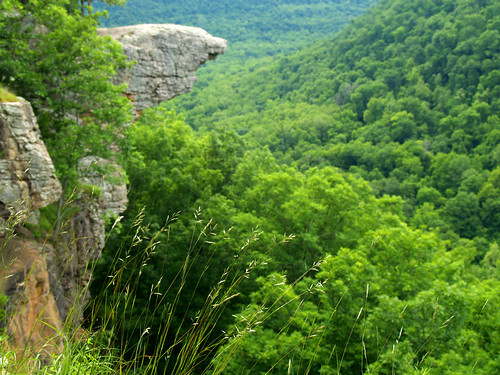 Hawksbill Crag is a beautiful spot, but Pinnacle Mountain and Petit Jean Mountain are much easier to get to. 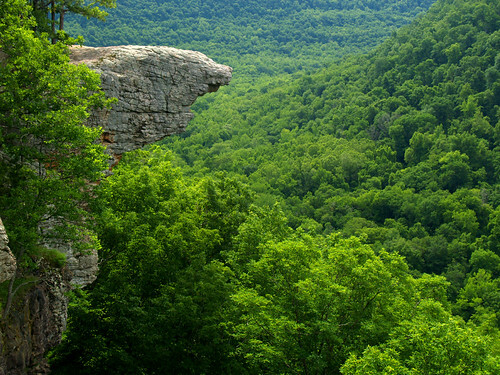 But that morning at Hawksbill Crag, there wasn't anyone out there keeping tabs on how many pictures we took. We had spent a few hours out there, and I was still amazed that we hadn't seen anyone else hiking out to the crag. 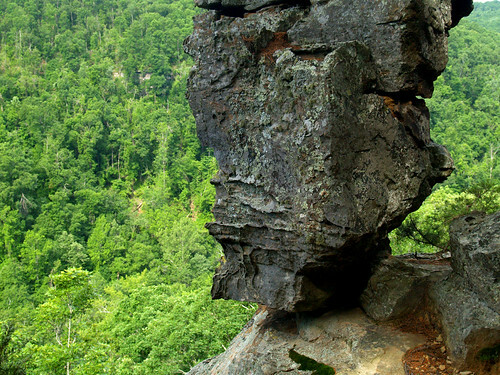 This is the view of a small point on the other side of Hawksbill Crag. That gap in the rocks on top of the bluff is big enough that you can stand between them (I did). 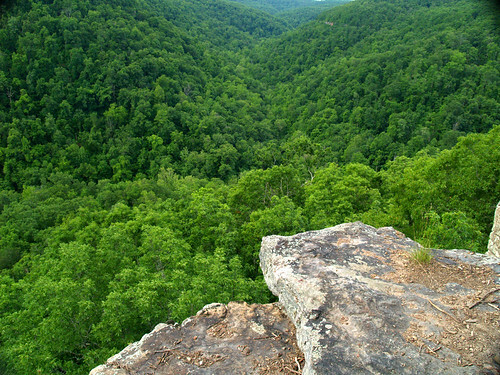 We stood on the crag, looking at the Ozark Mountains spreading out before us. 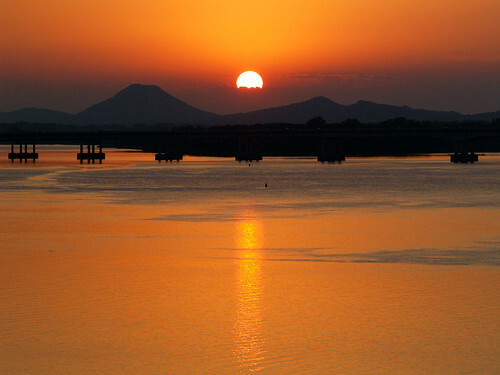 It is an amazing spot, and with an awesome view! We packed everything up and headed back to the trailhead. We soon began seeing people, large groups of them heading to the crag. I was glad that we got there early enough to have all of Hawksbill Crag to ourselves. 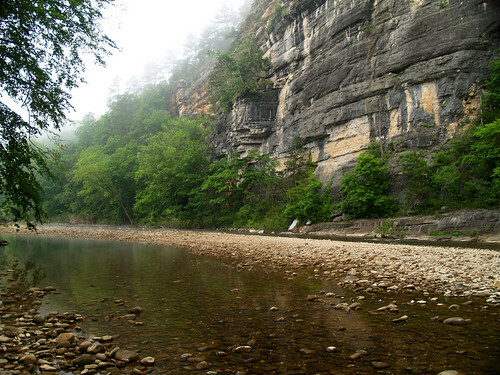 The Boxley Valley of the Buffalo National River is a great place. It's amazing to think that all of this could have been under water, if the plans to place two dams along the Buffalo had gone through. In fact, one of the dams would have been built near Boxley, near the mouth of the River. 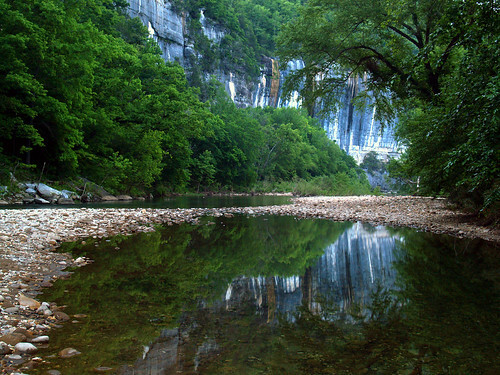 Luckily the conservationists won that battle, and the Buffalo River remains one of the last free-flowing rivers in the country. 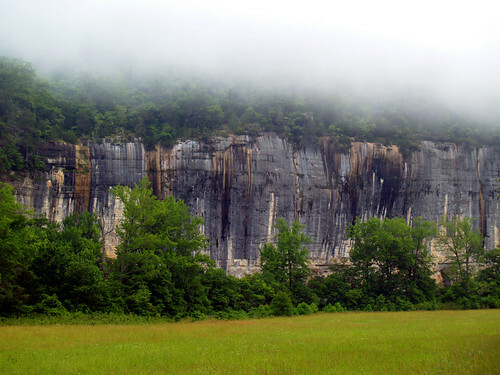 Boxley Valley is similar to Cades Cove in the Smoky Mountains, but here at the Buffalo the residents were allowed to stay on and live in the valley. So now you still have farmers working the fields, some of whom are descendants of the original settlers. The Valley is filled with old homes and barns. 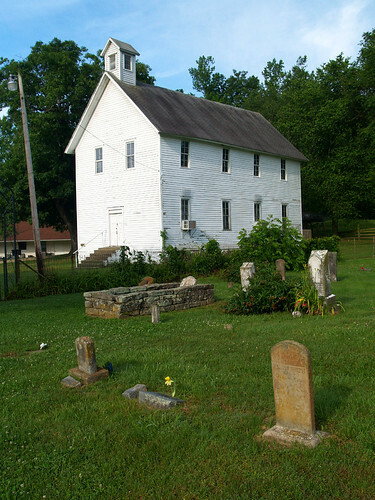 The center of the Valley is anchored by the Boxley Valley Baptist Church, built in the 1870s. I had hoped that some of the fog that was around Steele Creek would be out around Boxley, but no luck. We did spot some elk in the fields, and some of the trumpeter swans were out too. This church building was replaced with a newer church that sits nearby. 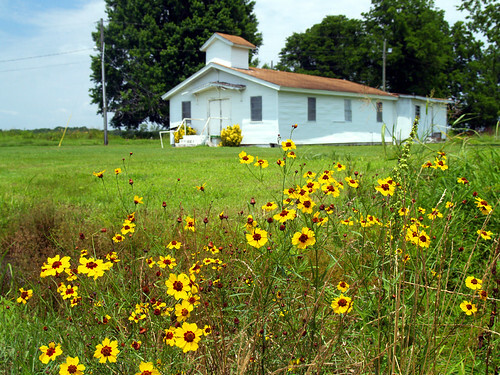 The old church building now serves as a community center. 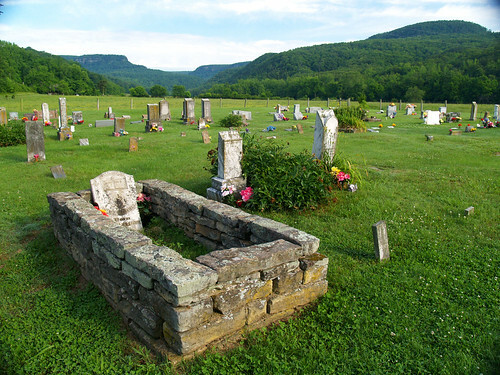 The cemetery around the church has headstones that date back to the 1800s, and include some Civil War veterans. Last Friday was my birthday, and I was not looking forward to it (it was the big 30). So to make myself feel better about it, I tried to organize a little camping trip. What better way to start being a 30-something than to be out in the woods in one of the most scenic places in the country? So on Friday I took off early from work and met up again with Zack Andrews in Conway. We drove up Hwy. 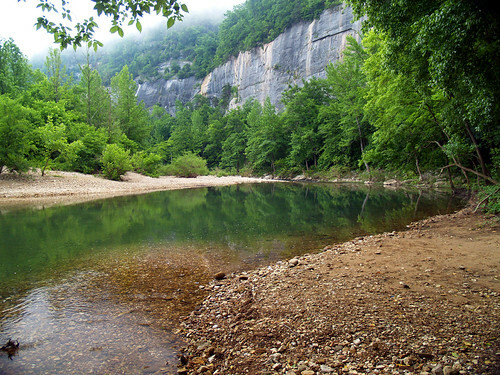 7 towards the campground at Steele Creek, along the Buffalo National River. But as we turned onto the dirt road that leads to Steele Creek, we were met with a sign announcing "Campground Full." Apparently we weren't the only ones who thought that camping at the Buffalo River would be a good idea that weekend. We drove down to the campground anyways. There were a few huge church groups there, occupying several campsites. But there were also some campsites with only one tent. I thought we could nicely ask one of those campers if we could perhaps share their campsite for the night, if we set up our tents away from their tents. We asked the first campers we met, and while they seemed reluctant at first, they agreed to share their site with us. Those campers would soon turn out to be among the craziest people I've ever met while out taking pictures. We brought out our tents, sleeping bags and ice chest and began to set up our little camp. Soon the campers we were sharing the site with came by to talk with us. They were clearly drunk, and said that the campsite was packed with church groups, which seemed to annoy them. They kept the radio on high, apparently just to annoy the other campers. Then they turned the conversation towards topics that are just a little too offensive and politically incorrect to mention here. They did mention they were from Missouri, so I was glad they weren't from Arkansas too. 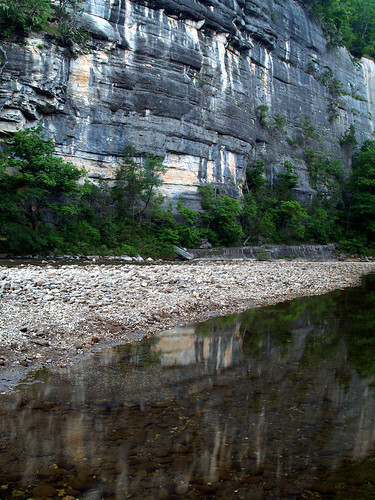 We politely excused ourselves to make a quick trip down to the Buffalo River before it got too dark. 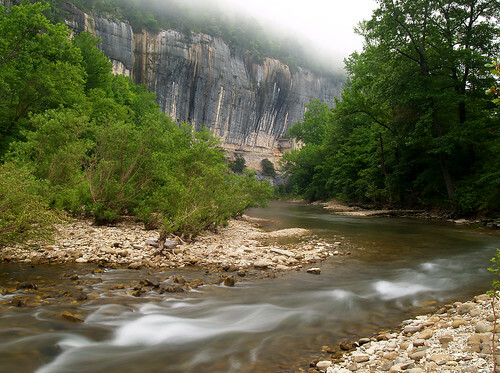 At Steele Creek, the Buffalo River runs under a huge bluff, called Roark Bluff. 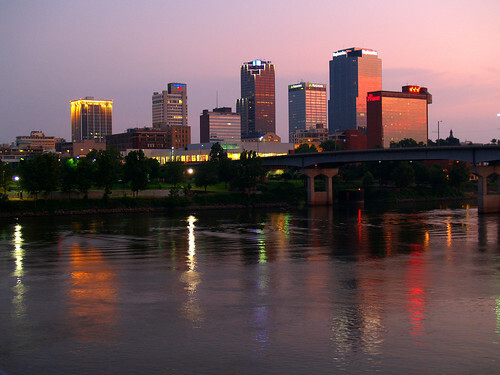 It's one of the tallest bluffs along the river. We had been up to Steele Creek a few weeks before, and the River was a lot lower now. In the dying light of the day, I tried to get a few shots of the bluffs reflected in the still waters along the river. I saw this view and sat and waited while a family was in the distance, throwing rocks into the water. They seemed to be taking their time, so I took some pictures anyways while there was still light. The family got photoshopped out of the view. There was hardly any light left, but I tried to get one last shot. The family was still off in the distance, right in the shot. So I sat and waited again, it looked like they were finally heading back to their campsite. They were nearly out of frame when one small kid began to have problems. He was walking along the river when apparently his pants managed to fall down. He yelled out, "MY PANTS!" for everyone to hear. His Dad turned around and yelled back, "What happened to your pants!" Then slowly walked over to help his kid out with the pants situation. When they got that sorted out, they finally strolled out of the frame. I hurried to get this shot before it got too dark. I tried to get a few more shots, but it was getting too dark for anything to turn out, so we headed back to our makeshift campsite. We didn't see our trashy campsite neighbors after that, but I envied the campfire they had. Since we weren't in an official campsite really, we didn't have a campfire. It turned a bit chilly that night, cold enough for us to see our breath while we talked. Here are our tents, with the ice chest (and beer) in the middle. My cheap Wal-Mart tent is the one on the right. We sat out and had some drinks in the dark. Well actually it wasn't that dark. There was a full moon that put out enough light that we didn't need flashlights to move around. The full moon hung over the sky right above the campground, so we decided to attempt some long exposure photography to capture it. My pictures weren't turning out, so I volunteered to do some light-painting for Zack while he was taking pictures. He set the camera to do a long exposure (well over a minute or so), while I walked around the campsite with a flashlight pointed at the ground (with the hope that the light from the flashlight would create a neat trail through the shot). 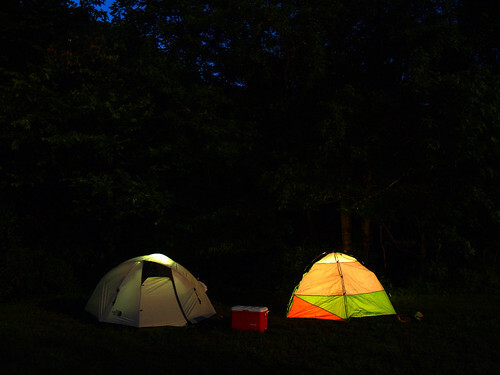 I'm sure it probably looked a little crazy to some of the other campers to see someone with a beer and flashlight randomly roaming through the campsite. Soon we moved over and tried to get some shots of Roark Bluff, which was being bathed in the moonlight. We tried some more lightpainting with the flashlight and then called it a night. I woke up early the next morning and saw that a low fog was hugging the top of the bluffs over the river. Zack was already awake and out taking pictures, so I hurried out to get some pictures too. 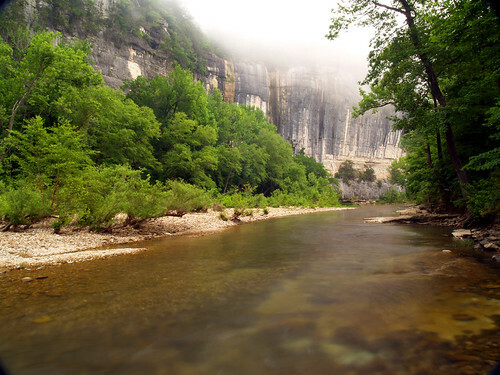 It was awesome, the views of the Buffalo River here are great any time of the day, but much better with some fog thrown in. We went back to the campsite and took down our tents, and got everything packed up. Before the fog burned off with the rising sun, we tried to get a few more quick pictures. 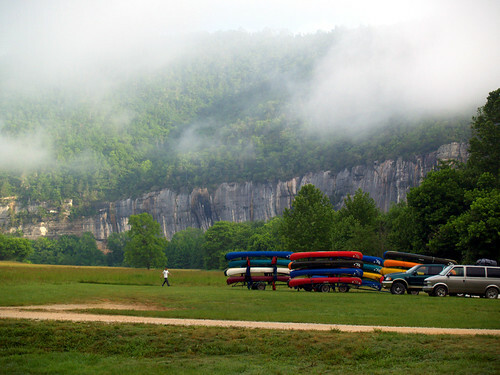 Next to the campsite is a large field, with Roark Bluff looming overhead. We drove over to a different spot along the River, near the spot where Steele Creek flows into the Buffalo. It was almost 8am, and there were already canoes getting dropped off for float trips. 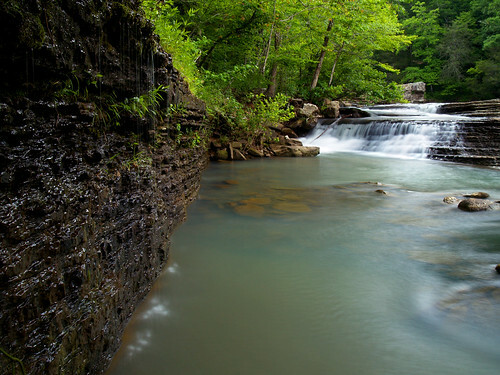 This is the view of the spot where Steele Creek flows into the Buffalo River. Someone had set up a campsite along Steele Creek not that far away. I guess they saw that the campground was full and just made their own little spot to camp. They did pick a pretty spot. The sun was finally breaking through the fog, lighting up the fields and trees around us.